Bodil Kjaer for E. Pedersen & Søn, table model 901, wenge and chrome steel, Denmark, 1959. This freestanding desk in wenge is designed by the Danish designer Bodil Kjaer. The desk can be used with multiple purposes, as a writing table, desk or just 'work table', as Bodil Kjaer herself called it. According to Bodil Kjaer the idea of the table is, "that it should be suitable with modern art and architecture." The table is part of a larger series of elements of architecture in 1959, with the intention to build flexible working environments. The series was produced from 1959 by C.I.Designs, Boston, USA, and from 1961 by E. Pedersen & Søn, Denmark. This piece shows an interesting rhythm of horizontal and vertical lines, as do most of Kjaer's designs. The front is divided into four drawers. The back has the same in inward gap yet without the drawers, yet this aesthetic choice unites the back and front and turns it into a monumental, architectural piece. The handles are all executed with a whole in the middle for functionality. The table's rise to fame was helped by its appearance in James Bond - From Russia with Love. Bodil Kjaer (1932-) is trained as an architect and is known mostly known for her designs in noble woods combined with a modern and sleek chrome base. The most important part of her furniture design career was from 1959-1964. She is mainly recognized for her flexible office furniture, designed in the 1960s. Her design language is greatly inspired by the Modernist masters such as Ludwig Mies van der Rohe. Her furniture has been greatly used in public buildings such as Harvard University and Massachusetts Institute of Technology. Bodil Kjaer (1932 Denmark - 1960), rare, low, square rosewood coffee table with chromed steel frame, circa 1959. The square rosewood top on two chromed steel U-form legs. 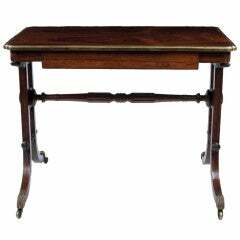 Fine Napoleon III rosewood and marquetry writing table with trellis work with one long freeze drawer. Danish rosewood coffee table with distinctively arched chromed steel legs, designed by Bodil Kjaer, circa 1959. 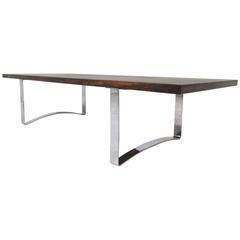 Serving table in rosewood with plates in Formica and steel for heating. Maker E. Pedersen. Early 19th century William IV English writing table. Made from yew and elm, featuring a burled top, circa 1835.